Bank stocks took the mightiest wallops — J.P. Morgan, Goldman Sachs, Morgan Stanley, Citigroup and Bank of America all fell over 3%. The proximate cause of yesterday’s panic was the ongoing warfare between localism and globalism. This anti-EU fellow was proposed by the populist Five Star Movement — Italy’s largest party — and the right-wing League party. Both parties hold the European Union in what can charitably be termed… low regard. The Five Star Movement and League party in turn blocked this eurocrat’s nomination. We are loathe to exaggerate… or exaggerate much, anyway. But many believe the election could throw the European Union’s future into doubt. “This could be the straw that breaks the camel’s back in the case of prospects for Europe,” warns Chris Rupkey, chief financial economist at MUFG Union Bank. Markets are concerned the anti-EU parties will form a winning coalition that could hold a referendum on leaving the EU — “Ital-exit” essentially. 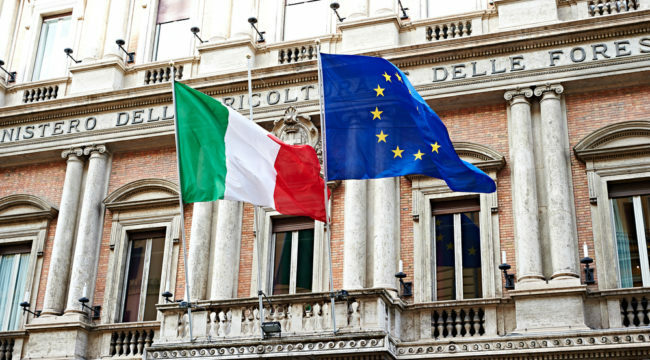 Italy boasts the eurozone’s fourth-largest economy. And what happens in Italy… might not confine itself to Italy. Government bonds from other eurozone nations also fell yesterday — which does not indicate investor confidence. And Italy’s bond market — which reflects its crippling debt levels — is the world’s third largest. Many banks have borrowed against that debt… or have indirect exposure. If these banks sink, they could send out rippling waves of failure… like a boulder plunged into a shallow pond. As the 2011–12 eurozone crisis demonstrated, the nightmare is a self-reinforcing downward spiral. Lower sovereign bond prices (and thus higher yields) weaken bank stocks and bonds, which results in a pullback in lending and capital market losses. That in turn undermines economic growth, which lowers tax revenues, further drops government bond prices and raises borrowing costs as politicians are forced to consider bailing out banks. U.S.-based banks risk getting caught in the crossfire because of their European asset holdings. That experience led him on a multiyear pursuit to determine the origins of financial crises… and how they spread. Brexit didn’t sink the euro because Britain was never on it. If Italy drops the euro it goes into history’s paper basket, where it joins the failed currencies of the past. We don’t suspect it will happen — we believe Italy will remain on the euro.